The house was built in 2006, over the remains and in the style of a historical farm and a 5x10 mt (16x32 feet) pool was added in 2018. At only 50 meters from the medieval walls of the town, it stands at the Center of an estate featuring aged oaks, walnut trees, olive trees, and fruit orchards. The owners, Paola and Giovanni, live in Davis, California (USA) and love coming to Todi for their vacations with their 3 children. During the rest of the year the apartment is available for renting. The house is composed of two fully independent apartments: one is on the ground floor and the other is on the first floor also available for renting. The house has outdoor parking space, quite unique feature for a house in Todi. Peaceful and secluded, the house is very conveniently located near the historic center of Todi. It provides the ideal location for day-trips to places of very high artistic, historical, natural and religious interest. In less than one hour drive guests can reach Orvieto, Perugia, Spoleto, Assisi (St. Francis), Spello, Cortona, Trevi, Lake Trasimeno, the Carsulae Roman Ruins, Arezzo (Piero della Francesca Frescoes), Norcia, Cascia and many other Umbrian and Southern Tuscan Towns (Siena is 90 minutes by car, Florence and Rome are 2 hours ). Also within one hour drive there are exceptional naturalistic sites such as “Cascata delle Marmore” (the largest waterfalls in Italy), Monti Sibillini and several natural parks. This housela was built in 2006 by our family, on the site of an old Umbrian farm. Our family has lived in Todi for 3 generations. Our grandfather first built his home in the center of Todi. Our father has built this Villa. The owners, Giovanni and Paola, consider Todi, the town were Giovanni was born, their second home. They live in Davis, California with their three Children. Our family built this house in order to be our vacation home, caring for every detail and loving every corner of it. We enjoy every moment in the summer when we can spend time here. We welcome our guests very warmly and we are excited that they can enjoy our home. 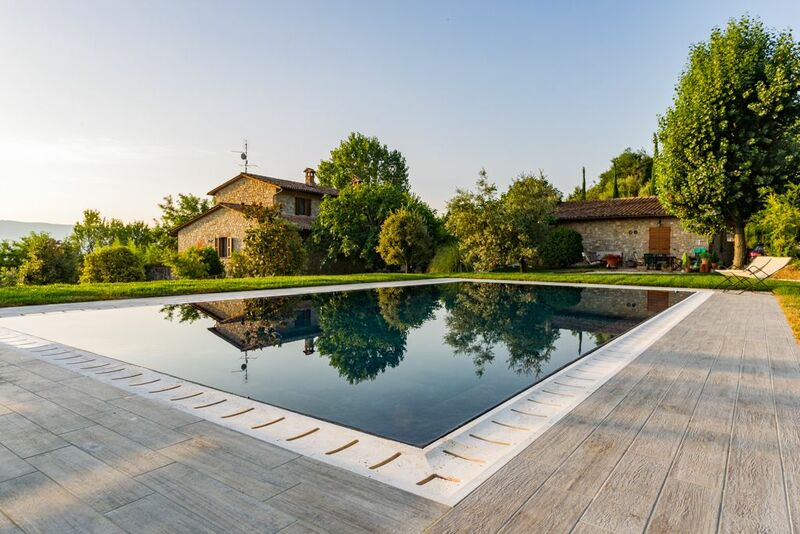 When staying at this property you will be surronded by olive and fruit trees, you can relax by the pool which overlooks the Umbrian hills and still be at walking distance from the center of the city of Todi. The home is ideal to relax in the front patio, to enjoy the view of Umbrian hills from the bedroom terrace or to take leisurely walks to the wall and to the center of Todi. It is a fantastic base to visit Umbria, Tuscany, Rome, Latium, Florence, Siena and many other great locations.' Moreover it is a great location for day-trips to historic and artistic towns. If you like sipping your Cappuccino in your bedroom, you can have it there and enjoy a great view of the Umbrian hills. If you enjoy a stroll and you like to have your cappuccino in Piazza you can just walk to Todi's center. A 10 minutes steep walk to downtown Todi, a marvellous medieval town. Terrific view over the Umbrian hills all around. independent heating for the whole house. Costs are included in the price. Outside the master bedroom, with outdoor armchairs, ideal for reading with a great view of the Umbrian Hills. The apartment is at the ground floor and easily accessible from the front patio. Thank you Adele for a wonderful few days!! Your personal greeting and amazing English made us feel at home in Todi right away. Thanks also for helping to call and ask about my lost wallet!! The location of the house is Perfect, letting us walk right into Todi through a lesser traveled access arch and revel in the amazing preserved streets, arches, and alleyways of this stunning city. THe apartment was spacious and very high quality, appointed with everything someone might need for living or cooking. We felt so at home here we can’t wait to get back. If you are heading I Umbria don’t miss Todi it Adele’s Place! This lovely home was our home for five days. It wasn’t just a place to stay, Adele and her family truly made it feel like our home. The accommodations, the setting, the entire area were the highlight of our trip to Italy. This was a bargain! Yes, yes, yes! This vacation rental was fantastic, more than we expected. We love our visits to Todi. Meeting Adele this time only made it better. We are planning to be back in about 2 years. My friends and I visited Todi for a wedding in the area. The city is beautiful and off the beaten path a bit which makes it even more special. The house is gorgeous and on an actual olive grove with a big fig tree in the front and a beautiful pool on the property. But, the best part was the host Adele! She was so open, gracious, and accommodating. She and her husband even drove us to the wedding, so we didn’t have to worry about having our car! Can’t wait to return. The house provides all the comforts of vacation living in a delightful location. Only 50 meters from the medieval walls of the town of Todi it stands at the center of a garden and an olive grove, a fruit orchard and vegetable gardeb. The owners, Paola and Giovanni, live in Davis California (USA) and love coming to the Villa for their vacations with their 3 children. Peaceful and secluded, the house is very conveniently located near the historic Center of Todi a spectacular medieval Town with a fascinating Piazza, great dining, beautiful churches and views on the Umbrian hills. The house also provides the ideal location for day-trips to places of very high artistic, historical, natural and religious interest. In less than one hour drive guests can reach Orvieto, Perugia, Spoleto, Assisi (St. Francis), Spello, Cortona, Lake Trasimeno, the Carsulae Roman Ruins, Arezzo (Piero della Francesca Frescoes), Norcia, Cascia and many other Umbrian and Southern Tuscan Towns (Siena is 90 minutes by car, Florence and Rome are 2 hours ). Also within one hour drive there are exceptional naturalistic sites such as “Cascata delle Marmore” (the largest waterfalls in Italy), Monti Sibillini Natural Park, Piediluco Lake, Bolsena Lake and several natural parks. Rental fee up to 4 guests is 110€/night. If guests are 5 or 6 there is an extra 15€/night. 100€ deposit to be paid cash at the check-in. Will be paid back at the check-out. For rentals longer than one week: extra cleaning fee of 30€/week can be requested (apartment will be cleaned and all lines and towels changed in the week end). Rates are subject to change until the reservation is confirmed.